What Lexie Loves: The big Gill Lewis post! The big Gill Lewis post! Hi everyone! This post, will be an author one: the Gill Lewis! I love her books so much, and I decided to share a few with you today! 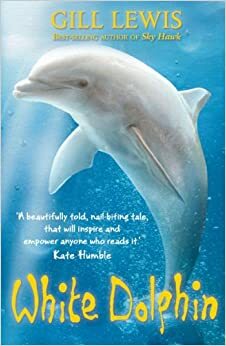 This is the one I read first: White Dolphin, after my sister devoured and absolutely adored it. So much so, that I found myself reading it the next day, despite my doubts! When Kara and Felix first set eyes on each other, they start up a hatred between both of them immediatly. But then they discover an ill dolphin on the bay, which both of them want to help. All they can do, is put aside their dislike, and cooperate together in order to try and save the dolphin. Unfortunately, many are against their plans, and those people have the power to beat the two of them anytime. Can they do it? I am so thankful to my sister, for keeping persisting to make me read this book, although my rejections. This is a beauty of a book, touching, heart-warming, and emotional. Even now as I look back on it, I can feel my heart pounding as I read, me gasping for breath after reading each word. Definitely one of my favourite books! However, I didn't take that instant liking to Gill, even after that unlike my very keen sister. 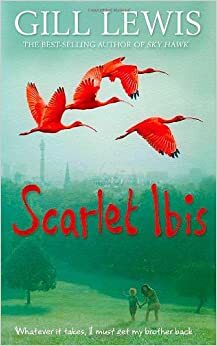 So when she persuaded me to read the next of Gill's books Scarlet Ibis, I was still very reluctant. But, again, she was right, of course! Scarlet and Red are inseparable brother and sister, Red needs his big sister, and Scarlet can't imagine life without Red. With a smoking, ill mum, who can't care for them, all the responsibility falls to Scarlet, and when a disaster occurs, tearing the relationship apart, everything changes. I've also read Sky Hawk and Moon Bear by Gill Lewis, but we'll save those for another blog post! I can conclude that Gill Lewis is, by far, one of my most favourite authors, and I would recommend her to all 8+, especially fans of tragic and emotional books!